Used by ancient Hawaiians as a self-massager, lomi sticks are used during lomi lomi massage to relieve tension and to relax muscles, joints and hard to reach areas. Ola Pono lomi sticks are small versions of the traditional lomi stick, designed to be portable and easy to use for self-care. Using Ola Pono Lomi sticks helps to minimize effort, allowing for deeper focus on pressure points. Ola Pono Lomi sticks are harvested from Guava in the forests of The Big Island and made by hand by students at The Lanakila Learning Center, a community program that assists at-risk youths. 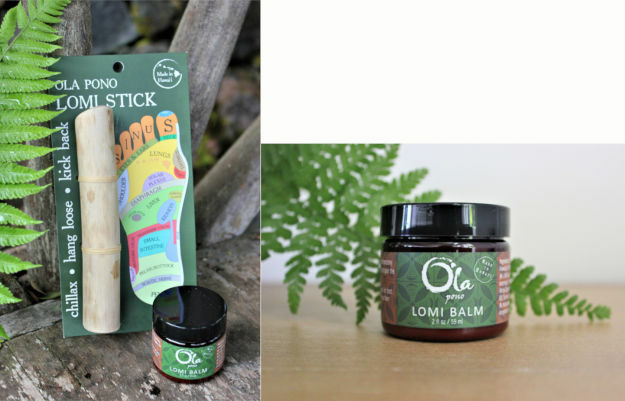 The Ola Pono Lomi stick is most effective when used with its sister product, Lomi Balm.